DOCOMOMO stands for DOcumentation and COnservation of buildings, sites and neiborhoods of the MOdern MOvement.DOCOMOMO Japan was first approved by the International DOCOMOMO committee in 2000. The organisation not only defines “Modern” architecture of Japan, but also evaluates and hence attempts to conserve 20th century Japanese architecture, which we are often inclined to think as old and obsolete. 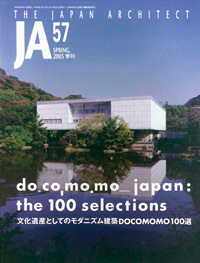 JA57 features 100 Architecture selected by DOCOMOMO JAPAN as well as 20 Architecture selected in 1999.